Below you will find some of the most fun and exciting packages in the Southwest to help you make the most of your stay in beautiful Durango, CO. You can enjoy great discounts on some of Durango's most fun and exciting activities with your stay including ski packages at Durango Mountain Resort, Durango Train packages, Mesa Verde National Park deals and much more! To get started, simply click on any package below. If you need help with putting your package together, call with one of our friendly package experts for personalized service! This fantastic getaway package offers value and convenience by combining your choice of lodging with round trip tickets on the historic Durango and Silverton Narrow Gauge Railroad. You can also build your own adventure with other unique Durango activities like Mesa Verde National Park, Rafting, Jeep Tours, Hot Springs and much more. Click here to book the Durango Train and Lodging package today! Come to Durango and enjoy some of the most exciting and unique adventures in the country - a high-flying, family friendly zip line adventure! Combine your choice of lodging with one of 2 zipline options in the Southwest. The first is Durango's longest running zip line with Soaring Tree Top Adventures which is a full day activity including a special train ride aboard the historic Durango and Silverton Railroad. The second is Durango's newest zipline with Full Blast Adventures where you will zip over 6 lines as you enjoy beautiful Colorado mountain views, now all year long! Looking for the ultimate thrill? Take on both for an unforgettable zipline experience! Click here to book the Zip Line Adventure package today! Stay three nights in Old West Durango and experience the two most sought-after attractions in Southwest Colorado. Enjoy your stay in one of Durango's best lodging options of your choice. On day 1, take a round-trip train ride on the Durango and Silverton Narrow Gauge Railroad and experience the beauty and majesty of the pristine San Juan Mountains along the Animas Valley. On day 2, enjoy an all-inclusive full-day tour at Mesa Verde National Park. Your guides will pick you up in the morning, teach you about the history and anthropology of the ancient Puebloan people, provide lunch and bring you back at the end of the day. Just bring your camera and your sense of wonder! Click here to book the Ruins and Rails package today! Durango has long been known for its incredible scenery and historic western charm. However, in recent years, Durango has also become very well known for another of its man-made wonders...our incredible craft beer industry! Durango is home to 4 craft beer micro-breweries and has quickly made a name for itself in the industry with some of the most delicious beers in the west and in the U.S.! Now, for the first time ever, we have a complete tour of these breweries including all of your transportation so you can sit back and enjoy. Come find out why we are the self-proclaimed city of brewerly love for yourself with this unique package including lodging and a tour of the 4 breweries! Click Here to book the City of Brewerly Love package! This package will give you a unique and in-depth understanding of the distinctive cultural heritage of the 4-Corners Region. You will visit 2 of only 20 World Heritage sites in all of the U.S. and learn about some of the most rich and fascinating cultural history in the world. Investigate the ancestral Puebloan people (formerly known as the Anasazi) with a visit to Mesa Verde National Park and then Chaco Canyon, both major centers of Puebloan culture and and development over 700 years ago. Click here to book your World Heritage Package today! Durango is the perfect place for a weekend getaway to slow down, reconnect and catch up with each other and rekindle your romance. Does your perfect getaway include a stay in a beautiful downtown hotel with a relaxing Hot Springs soak and a couples massage? Or perhaps a romantic sleigh ride for 2 or a ride on the Durango train through a majestic winter wonderland, and dinner for two. No matter what your idea of the perfect romantic getaway is, we will help you make it a reality in Durango! Click here to book your romantic getaway today! Enjoy a fun family vacation rich in history and scientific exploration with the Durango Discovery Package. This package includes lodging combined with a visit to the new Durango Discovery Museum. Located on the banks of the Animas River in a historic coal-fired, steam-generated AC power plant, the Durango Discovery Museum presents an array of interactive exhibits and activities designed to provide an entertaining and inspiring look at energy - past, present, and future. 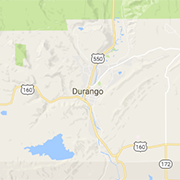 Click here to book the Durango Discovery Package today! Stay at one of Durango's most distinctive and deluxe properties and enjoy fantastic discounts on world-class skiing / snowboarding at Durango Mountain Resort. Want more out of your trip? Also enjoy great deals on rentals, Hot Springs, Hot Air Ballooning, snowmobiling and more! Click here to book the DMR Ski / Snowboard package today! Experience the snow covered San Juan's and the high-country views aboard The Durango Silverton Narrow Gauge Train, taking you through pristine country that you cannot see any other way. Enjoy great discounts on your lodging and your train tickets with this unique package. Want more? Also enjoy great discounts on other fun winter activities such as snowmobiling, hot springs, and much more! Click here to book the Durango Winter Train package today! When you book 3 nights of lodging in Durango and 3 days of lift tickets, we'll throw in a fourth day and night for FREE! Add 3 days of rentals and you'll receive a 4th day FREE also. Take advantage of the old town western charm of Durango's historic downtown and one of the best ski package deals in the U.S.! Click here to book the Buy 3 Get 4 package today! All Aboard!! Prepare as your family takes a magical round trip journey to the North Pole aboard the historic Durango and Silverton Railroad. This holiday ride is fun for the entire family as kids wear their pajamas and, during the ride, enjoy hot chocolate as the Polar Express story is read over the PA system. As the train pulls into the North Pole, Santa and his helpers will board the train and bring the spirit of Christmas to life as everyone sings Christmas carols on the way back to Durango! Kids will even receive a special sleigh bell gift from Santa as the magic of the Polar Express story comes to life this winter!! Click here to book the Polar Express package today! Please note that some packages are seasonal and not available at all times. Please check back often or call our package experts for updated info and availability.